What kind of components are black blobs on a PCB? In low-cost mass-produced items I often run into black blobs of what looks like resin applied directly on top of something on the PCB. What are these things exactly? I suspect this is some kind of custom IC that is layed out directly on the PCB to save on the plastic housing/connector pins. Is this correct? If so, what is this technique called? 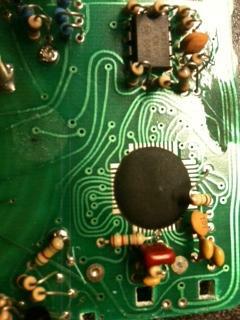 This is a photograph of the inside of a cheap digital multimeter. The black blob is the only non-basic piece of circuitry present, along with an op-amp (top) and a single bipolar junction transistor. It's called chip-on-board. The die is glued to the PCB and wires are bonded from it to pads. The Pulsonix PCB software I use has it as an optional extra. The main benefit is reduced cost, since you don't have to pay for a package. Like Leon said the techniques is called Chip-on-board (COB). You do exactly the same to bond the die directly to the PCB as you would to bond the pins in an IC package. Savings: no package needed. (You could say no soldering also, but that has to be done anyway, so that's not really something you save on). COB is not cost-effective for small series, and with a few exceptions you will only see it on mass-produced products (100k~1M/year). The blob is an epoxy resin to protect the IC with the bonding mechanically; the bonding wires are very thin (as thin as 10\$\mu\$m for gold wire) and therefore extremely fragile. Another form of protection it offers is reverse engineering protection. This is not fool-proof (the resin can be removed), but it's a lot harder to reverse-engineer than simply desolder an IC. IP protection example: until a few years ago FPGAs always needed an external serial memory to load their configuration from. This configuration could be an almost complete product design, and therefore expensive. Yet, simply by tapping the communication between FPGA and configuration memory everybody could copy the design. This can be avoided by COB-ing FPGA + memory together under a single epoxy blob. note: the die in a BGA is also bonded on a thin PCB, which routes the signals from the edges of the die to the ball grid at the bottom. 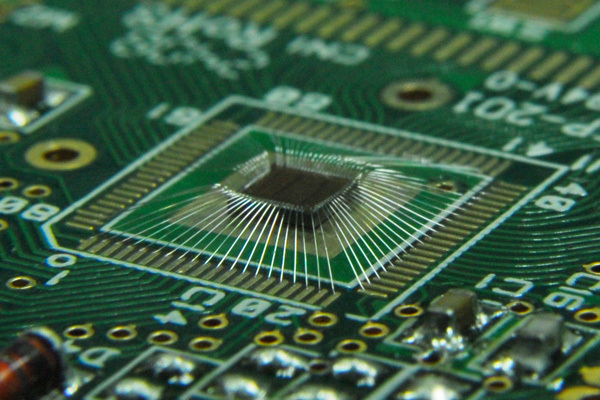 This PCB is the base of the BGA's package. It is a "Chip on board". It is an ic wire bonded directly to the board, and then protected with some epoxi (the "black thing"). I know this is an old question, but there is one aspect of COB that was not mentioned. The issue is that you must start assembly with Known-Good-Die. IC components are nearly always tested after they are packaged. It's simply easier to handle a packaged component than it is to place tiny probes on the unpackaged chip. This is a problem for COB because if you place an untested chip, you potentially have to throw away an entire assembly if that chip turns out to be bad. So, COB usually must use KGD. The chip testing is usually done at the wafer level, before the die are diced (sawn apart). Unfortunately this testing is usually slow and expensive (relative to testing in packages) so this consumes some of the potential cost savings of COB. Not the answer you're looking for? Browse other questions tagged components integrated-circuit or ask your own question. How to reduce the AVR MCU footprints on PCB? How does this blinking LED circuit work? What IC is in this particular black blob on my pocket calculator? What is this white circle on this circuit? Reverse engineer: How do I remove the black plastic that hides the ics? What manufacturing process produces resin coated chips in consumer toys? Why would a COB be utilized in this circuit? What kind of glue should I use for PCB-mounted components to avoid vibrations? What are these components in these circuits? What kind of components are these? What coil-like components are these? What kind of diodes are these?